If you are currently not an IAAPS member, please become a member by following the instructions at the website listed below. 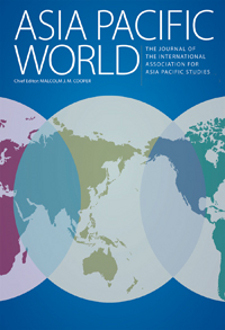 To become an IAAPS member, you will be asked to pay subscription fee to our journal, Asia Pacific World, published by Beghahn Books, Inc. You can subscribe to the journal via the publisher’s website. An individual membership fee is 80 USD, and a student membership fee is 35 USD. These membership fees include a one-year subscription to the journal (the student membership allows online access only). If you already have a valid IAAPS membership, you do not need to do this online registration. In order to have a high level of participation of researchers from Southeast Asian countries, we set up a participation subsidy system this time. This subsidy is for researchers and students who belong to universities / research institutions in Southeast Asian countries and have financial difficulties. We will return 50 USD to faculty members and researchers with an Individual membership, and 20 USD to student members at the conference venue. Please check the box ‘I would like to apply for this subsidy’ in the online registration form, and enter the name of your research institution. Please note that if any piece of information is missing, you will not be eligible for the subsidy. Also, if you do not show up at the conference, we will not pay the subsidy to you. All presenters must pay 1,500 Philippine peso (around 30 USD) at the conference reception desk. This fee includes costs for lunches, coffee and snacks, proceedings, and such.